Members of Iran's Azeri minority have long complained that their rights are stifled. They make up a quarter of Iran's population, but claim the authorities are worried about an uprising by ethnic Azeris, as Tom Esslemont reports from the Azerbaijan-Iran border. By 0900 the border between Azerbaijan and Iran is jammed. Dozens of Azeri men and women with large plastic bags jostle to squeeze through a grey metal gate to passport control - and beyond that, Iran. Border guards shout at them in an attempt to keep them in line. It fails. For decades Azeris have crossed this fluid border to see family and friends on the other side. Iran has a sizeable ethnic Azeri minority and many well-known Iranian politicians and public figures past and present have Azeri roots. The territory we now know as modern-day Azerbaijan was once part of the Persian Empire, but was ceded to Tsarist Russia in the 19th Century. Azeris on both sides of the border share a common language and cultural heritage. There have been Turkic-speakers living on both sides of the Araxes river, which now forms the border, for more than 700 years. These days the existence of a border between the two Azeri-dominated lands is just taken for granted. 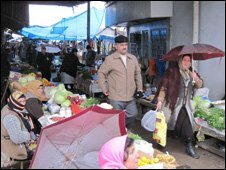 "I go to market on the other side because the food is cheaper there," says Gulchohra Hasanova as she emerges through the border gate, her shopping basket laden with nuts and fruit. She had returned from Iran with enough food to last her a few days. Hers is a story echoed by dozens who cross back and forth on a daily basis in the border town of Astara. Iranians also come here to buy alcohol - the sale of which is banned in their country. But the freedom of movement is not open to everyone. Not far away in his damp, dark two-room apartment I meet Mohammad Rza Lavai, an Iranian Azeri. As he tries to light the gas stove in his kitchen he tells me he is on the run. He says he fled Iran in September, claiming he had been persecuted for his ethnicity. He shows me articles he wrote while he was there - printed in Azeri newspapers - in which he criticizes the Iranian government for their "treatment of the Azeris". "They did not like it when I used to write in Azeri and publish my work in newspapers: I strongly criticised the regime," he says. "Soon the authorities called me in. I was jailed several times." He is visibly shaken and points out that he is now on medication. "In jail I was electrocuted and beaten," he continues. "There is no such thing as human rights in Iran." It is impossible to verify Mr Lavai's story, and the Iranian constitution does not ban Azeri - but I came across others with similar stories, who did not want to speak on record. Many Azeris living in Iran often complain that their culture and language are restricted there. Emin Huseynzade, Caucasus project manager at the think tank Transitions Online, says there has always been an awkward relationship between Azerbaijan and Iran. "It started during the Shah period," he says. "And [it has become] a tradition: to keep Azeris out of education, out of the [Iranian] culture. 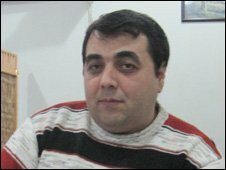 "People were not allowed to give their son or daughter an Azeri name. The cultural life in Iran pushed Azeris to become Persians. That is the main problem actually." Professor Ali Ansari of St Andrew's University, an expert in Iranian history, says it is seen differently by the Iranian authorities. "Azeri culture was suppressed in Iran but it has been tolerated and at times encouraged for political purposes," he says. "However the Iranians are understandably very sensitive to any murmur of separatism and will crack down quickly on this." These days there is another problem, in that Azerbaijan now supplies Israel with much of its oil. By way of a response, Iran appears to be showing its anger through television. When you turn on a television set in southern Azerbaijan it is possible to pick up Iranian TV. Sahar TV broadcasts in the Azeri language. Its programmes regularly contain criticism of Azeri policy. 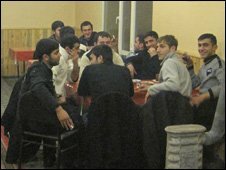 Men watch Sahar in tea rooms in towns like Astara and nearby Lenkoran. The television set is always on, though not necessarily tuned into Sahar all the time. Many say they only watch it out of curiosity, calling it Iranian propaganda. Azeri journalist Khagani Ibadov says: "There's no doubt that Sahar TV is the voice box of the Iranian authorities. "The presenters often accuse Azerbaijan of being a Zionist regime because of our strong ties with Israel. It shows just how worried they are about Azeri nationalism." Sahar TV has, on at least one occasion, doctored an image of the Azeri flag so that the crescent moon was replaced with the Star of David, I was told. As Mr Ibadov warms his hands on his glass of hot green tea he tells me Sahar TV is state-controlled. "The programme presenters say everything that the Iranian government is too afraid to say directly," he says. Back at the border Azeris continue to cross freely into and out of Iran. In spite of everything Iran and Azerbaijan do enjoy bilateral ties and last year their trade turnover was reported to be $700m (£450m). Lorries, emerging through thick soupy puddles that have collected at the border, carry Iranian produce, destined for local markets, the Azeri capital, Baku - and beyond. The trade continues, but the stark differences between these two neighbours remain.